The mater is made of a single piece of brass. The face of the limb is divided into two concentric circles, the outer one bearing the hours numbered 1 to 12 twice, the inner one with a scale of degrees in four quadrants with 90? at the zenith, divided to 30?, subdivided to 5? and to 1?, numbered by 10?. The inner part of the mater is engraved with a wind rose with 32 directions named in Dutch. The main directions are indicated 'O' (east), 'M' (south), 'I' (west) and with an arrow for the north. The intermediate directions are marked with stars. Suspension is by means of a very elaborate throne, decorated with three faces, one front and two profiles between scrollwork. Two rings complete the suspension system. The copper rete is formed with a heart shape inside the ecliptic, which is engraved with a zodiac scale with the zodiacal signs named, divided to 5? and to 1?, numbered from 10? to 30? by 10?. The spelling 'PISSES' is unusual. There are no east-west and meridian lines, and the 24 star pointers, named in Latin, are earth-worm shaped. The single plate is engraved on one side with east-west and meridian line, tropic and equator lines and almucantars engraved every 3? and numbered from 9? to 81? by 9?. The azimuth lines are engraved every 5? and from [0?] to 90? every 15? in both directions. The astrological houses are marked I to XII on the limb of the plate. The unequal hour lines are indicated 1 to 12, and the twilight line is indicated 'LINEA CREPVSCVLINA'. The latitude is marked 'LATITVDO 44 30'. The back of the plate is engraved with a quadratum nauticum with a wind rose with 32 directions named in Latin. 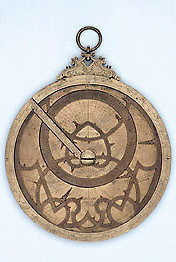 The wind rose is inscribed in a circle which is in turn inscribed in a square, reaching the limb of the plate. Between the circle and the square the main eight directions are marked in Dutch. The square is graduated [0?] to 90? (at the edges) to 10? and to 2?, numbered by 10?. In the four parts of the plate between the square and the limb are engraved four blowing faces, the southern of which is a skull, with the names of the winds in Greek and Latin characters, in scrollwork. At north is 'Boreas' and 'naiaparetias' (in Greek characters) and 'Septentrio' (in Latin), at east is 'apeleotne' (Greek) and 'Subsolanus' (Latin), at south is 'notos' (Greek) and 'Luster' (Latin), at west is 'zefiros' (Greek) and 'favonius' (Latin). The back of the mater is engraved on the limbs with four quadrants of 90? with 90? at the zenith, divided to 10?, subdivided to 5? and to 1?, numbered by 10?. Next is a zodiac scale with the signs named, sharing the division with the calendar scale, numbered from 10? to 30? by 10?. Next is a calendar scale with the first point of Aries corresponding to the 10th of March, with the months named and their 10th, 20th and last day numbered. Next to the centre is, on the bottom half, a double shadow square marked 'Vmbra Recta' and 'Vmbra Versa', divided to 3 and to 1, numbered by 3. Inside it is inscribed 'Scalae Altimetrae' and the space is dotted. Below the shadow square is the signature 'Io:Dom:Feciolus Trident: faciebat' and in the space between the shadow square and the calendar circle are flowers and arabesques. On the top half on the plate are hour lines marked 1 to 12 in two directions and at the centre is a Maltese cross with the inscription 'Astrolabum hoc ex tabulis Bergensibus construendum sibi curauit Julius Caesar Luchinus Bononiae anno 1558' and the space is dotted. The alidade is counterchanged and has two double sights. It is engraved with flowers on one arm and on the other is graduated with an unequal scale and has the symbols of the zodiac signs. The ends are in a Gothic style. The rule is decorated in a Gothic style and has an unequal scale of latitudes, starting from about half way, [0?] to 70? towards the centre and [0?] to 231/2? in the opposite direction. The scale is divided and numbered by 10?. The two directions are marked 'LATITVDO SEPTENTRIONALIS' and 'LATITVDO MERIDI'. The screw looks too big and is probably a later replacement, and is kept by an octagonal nut. See R. T. Gunther, The Astrolabes of the World (2 vols, Oxford, 1932).